Could RNA be the molecule which started life on earth? Georgia Mills spoke to Columbia University's Laura Landweber. Laura - Getting some of these raw materials organised would have been a really critical step. And also getting them encapsulated today into what are cellular structures or in what could have been other ways in which compartmentalisation could have captured the raw ingredients that were necessary for life. There are many steps that would have had to have taken place, but a key one along the steps towards the origin of modern life is how information arose, and how that information could become transferred into functional properties. So we have metabolism in cells and we also have genomes in cells, and linking those two together is one of the most critical steps in life’s origin. Georgia - Genomes are the sum total of the DNA of a living thing, it’s the instruction manual you need to make proteins, and copies of yourself, and metabolism is the process of obtaining energy from something in the environment. Laura - Metabolic functions - the notions of another cell’s metabolism, the day to day events that go on in the cell. Today they are primarily catalyzed by proteins. Georgia - Proteins take on many important functions in our modern day cells. Including our cells’ energy production, and also DNA function. But here’s the rub. To make proteins today we need the coding instructions from DNA, but DNA – it doesn’t work without the help of proteins. We have a chicken and the egg paradox. How did it first get started? Laura - There’s a real chicken and egg problem. People have wondered for decades which came first - the information content of a cell, which is today largely in the form of a DNA genome or the functional components of a cell, today largely supplied by proteins. So, to answer, if we can, this chicken and egg paradox - which came first? The structural properties of proteins that can perform metabolic roles or DNA. Which came first? To answer that question RNA came to the rescue. Georgia - RNA is very similar to DNA. Just like DNA it’s made from four bases and can form long chains. Today, RNA is used as a kind of middle-man – helping to send messages around. But there’s a clue in one part of our cell as to another role RNA may have had. Laura - Housed within all of our cells is a big factory called the ribosome. 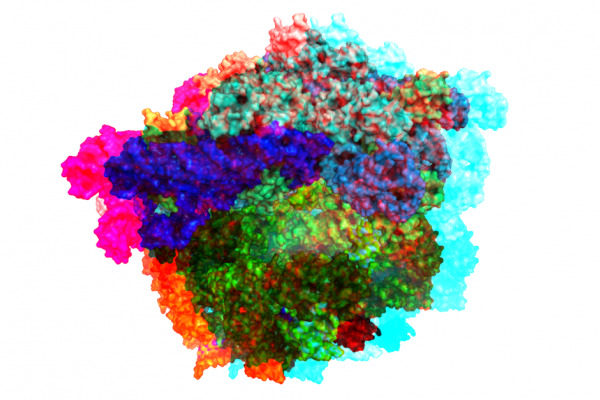 The ribosome takes RNA sequences and makes proteins. One key that we learned from the structure of the ribosome is that at its catalytic core, the functional part of the ribosome that’s really in the business of making proteins, is only RNA, and that helps us understand that actually you can make proteins from RNA. So you can take RNA molecules and add that to what’s called a ribosomal RNA and make something out of it that becomes a protein. There’s a lot of protein itself in the ribosome that helps make other proteins but it would be a bit of an ontological quandary if you needed protein to make protein. So the fact that you can make protein from RNA helps us build a model for how proteins and protein synthesis evolved from a more primitive system on our planet. It’s beautiful and elegant to recognise that at the catalytic core of the protein synthesis apparatus in pretty much all cells on our planet is an RNA machine, and so that’s called a ribozyme - it’s also part of the ribosome. These factories for producing proteins are comprised of this mixture of RNA and protein that today function together. But it helps us understand how simpler structures built entirely of RNA, probably assisted by smaller bits of proteins, namely the immuno acids themselves, could participate in complex processes. Georgia - The idea that RNA came first and was helping to build proteins and provide this information is known as the RNA world hypothesis. But how did the RNA itself get created? Laura - The building blocks of RNA are four letters - A, C, G, and U. The formation of those original building blocks is something which is challenging to explain - some researchers have recently made some terrific progress. But we can also look to our own cosmos to get the basic understanding of where some of this information could have arisen. Even if you look on pieces of meteorites, you can find some of the building blocks for both amino acids and for nucleic acids there. One of the strengths of this field has been it’s history in organic chemistry, demonstrating the synthesis of the nucleotide adenine, was one of the first experiments, the Oro experiment. It was a long time before another lab demonstrated the synthesis of some of the other nucleotides, but now we have a good understanding that it’s feasible to synthesise them on an early planet. One can even detect the raw precursors to a lot of these nucleic acids in meteoritic material, which means that the precursors for life, as some like to say, would have been raining down on our planet in it’s early days arriving from interstellar dust as well as meteorites, and also from comets. Themselves replete with water, they would have delivered possibly a lot of the opportunity for the raw organic materials needed to create the building blocks of life on an early planet. Next The world's oldest fossil?